Gloria dePasquale joined the Philadelphia Orchestra ‘cello section in 1977 at the invitation of Eugene Ormandy. Prior to becoming a member of the Philadelphia Orchestra, Mrs. dePasquale served as Associate Principal ‘cellist of The Buffalo Philharmonic Orchestra under Michael Tilson Thomas and was also a substitute player for the Boston Symphony Orchestra and Boston Pops Orchestra. Born in Evansville, Indiana, Mrs. dePasquale credits the public school music program of her home town for her introduction to the ‘cello. She graduated with honors with both her BM and MM degrees at The New England Conservatory of Music in Boston where she was a student of Stephen Geber. Mrs. dePasquale currently serves on the Board of Visitors for NEC. ‘Cellist of the dePasquale String Quartet for more than two decades, the quartet was in residence at Villanova University and presented a highly acclaimed chamber music series performing with such artists as Yo-yo Ma, Emanuel Ax, Christoph Eschenbach, Yefim Bronfman, Wolfgang Sawallisch, and Andre Watts. Mrs. dePasquale was also ‘cellist in the dePasquale trio, performing alongside her late husband William, and daughter, Francesca. Mr. and Mrs. dePasquale were frequent soloists with area community and youth orchestras, performing both the Brahms Double Concerto and the Saint Saens La Muse et Le Poet. Their last public performance together as soloists was in June of 2010 in Verizon Hall at the Kimmel Center in Philadelphia performing with The Philadelphia Youth Orchestra. In 2013, Mrs. dePasquale was soloist with the Philadelphia Youth Orchestra, performing Haydn C Major Concerto in Verizon Hall and last season Mrs.dePasquale was featured in the Haydn Sinfonia Concertante. Mrs. dePasquale is an advocate for music education both at The Philadelphia Orchestra where she chairs the musician education committee and in The Philadelphia Youth Orchestra where she is artistic advisor to the organization and artistic advisor and conductor of the PRYSM and PRYSM Young Artist Orchestras, founded in 2007 with her late husband, William. Mrs. dePasquale maintains a large private studio and runs monthly masterclass and performance classes for her students. Her graduating students regularly are accepted into the nation’s finest conservatories, colleges, and universities. 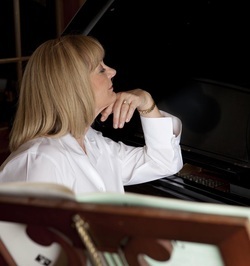 Mrs. dePasquale teaches for the New York State School of Orchestral Studies at Saratoga Springs New York every August and also is on the faculty of Luzerne (NY) Music Center and the Philadelphia International Music Festival where she conducts a soloist string ensemble. Mrs. dePasquale serves as a musician representative on the Board of Directors of The Philadelphia Orchestra and as an elected representative of the Musicians’ Committee of The Philadelphia Orchestra.